For this painting, I decided to start off with a white background. I then blocked in the owl, painted in the background using more transparent washes (hence the reason for starting off with a white background) and then added in the final details. Worked rather well and I am really pleased with the final painting. 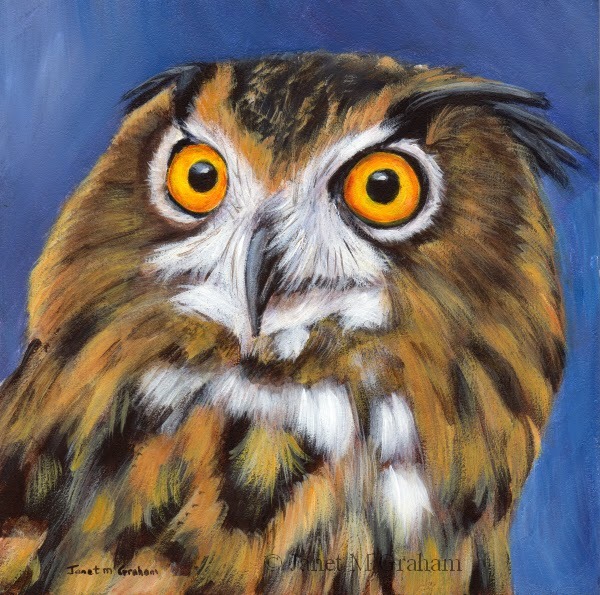 Owl measures 6 x 6 inches and is painted on Ampersand Gessobord panel. Many thanks to Sandy Scott for the reference photo. When staying in Richmond, Tasmania, the accommodation had an old stable so I took a photo of the old door front. I used a bit of creative license with the brick work and flowers. I used texture paste to create the texture on the walls, paths etc. The texture paste worked really well so will have to use it a bit more often when I want to create more texture in a painting. 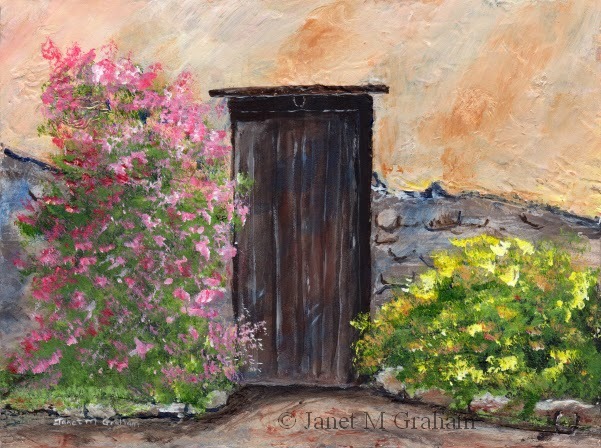 Old Stable Door measures 8 x 6 inches and is painted on Ampersand Gessobord Panel. With this one, I had the background a bit too light to begin with but once I darkened it, the painting just come to life. Rather pleased how it finally turned out. The Whinchat is found in Europe and Western Asia and winter in Africa. They range between 12 - 14 cm in length and weigh between 13 - 26 grams. Whinchat measures 2.5 x 3.5 inches and is painted on 300gsm Arches smooth watercolour paper. I love the colouring of this bird. Everything just worked with this one and I am really pleased with the final painting. The Yellow - Tufted Honeyeater is found on the eastern and south eastern Mainland Australia. They range between 10 - 12 cm in length and weigh on average 22 grams. 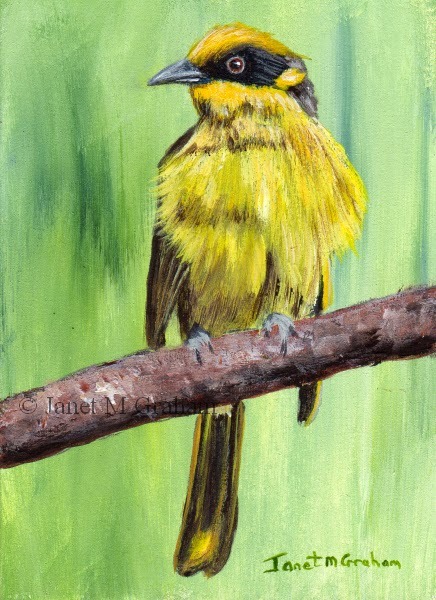 Yellow Tufted Honeyeater measures 2.5 x 3.5 inches and is painted on 300gsm smooth Arches watercolour paper. This one was fun to paint - love the autumn colours. Really pleased with the final painting. 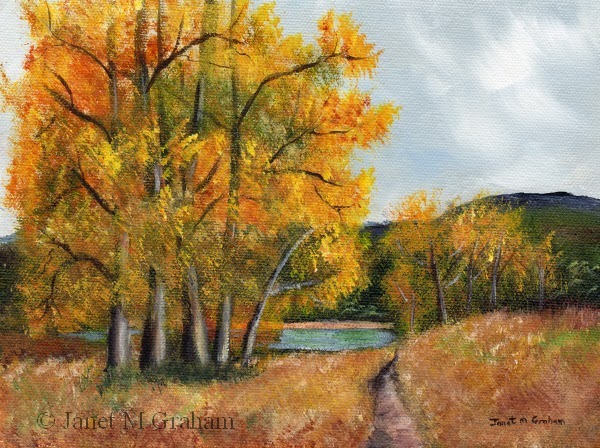 Autumn Lake measures 8 x 6 inches and is painted on Raymar Feather Lite smooth canvas panel. Many thanks to Roy Simmons for the reference photo. Originally I wasn't going to be add the rocks into the scene but when I had finished, the painting looked a bit flat so I decided it need the rocks. I started the rocks with a palette knife and finished them off with a brush - worked really well and I like the texture it created. Autumn Tree measures 6 x 6 inches and is painted on Ampersand Gessobord panel. I enjoyed painting this one and it another one that everything just worked. The Rose - Breasted Grosbeak is found in cool temperate North America and migrates in winter to Tropical America. It is a fairly large songbird measuring between 18 - 21 cm in length and weighs between 39 - 49 grams. 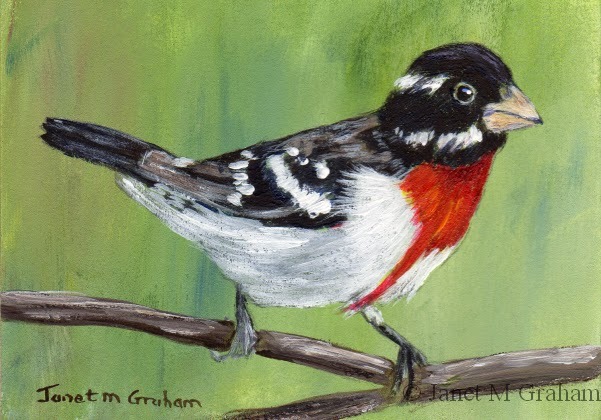 Rose Breasted Grosbeak measures 3.5 x 2.5 inches and is painted on 300gsm smooth Arches watercolour paper. The Carolina Wren is found in the Eastern half of the United States, the northeast of Mexico and south of Ontario in Canada. They are measure around 12 to 14 cm in length and weigh between 18 - 22 grams. An interesting fact about these wrens is that only the male sings the loud song whereas in other wren species both the male and female sing together. 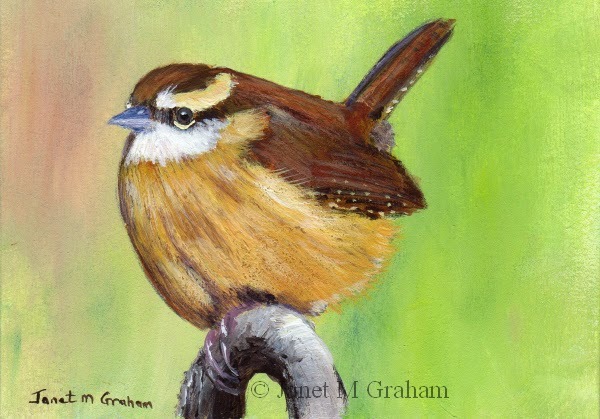 Carolina Wren measure 3.5 x 2.5 inches and is painted on 300gsm smooth Arches watercolour paper. I couldn't resist painting this cute foal. 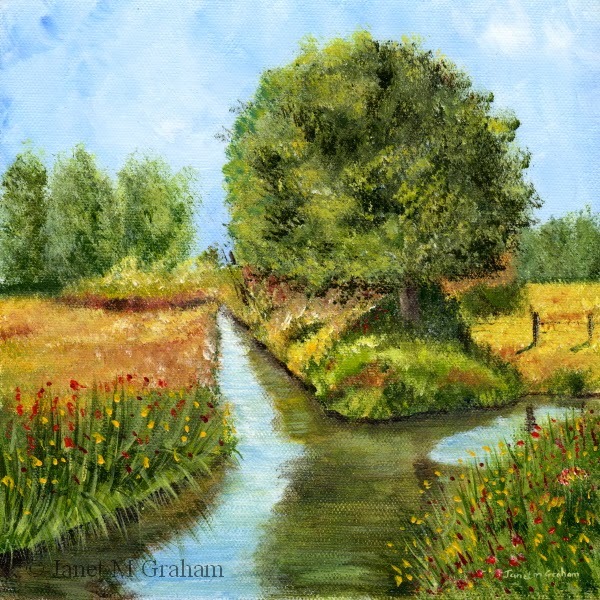 I used the fan brush again for the meadow - just the ideal brush for grasses/fields and also works well for tree foliage. Really pleased with the final painting. 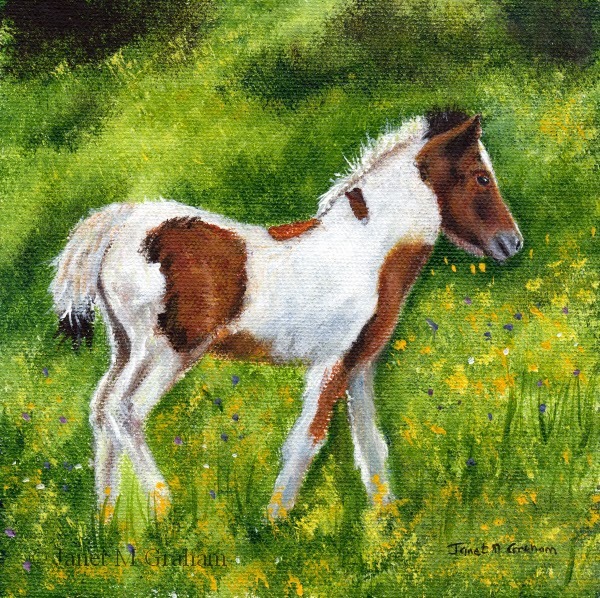 Foal measures 6 x 6 inches and is painted on Raymar Feather Lite Canvas Panel. I really enjoyed painting this one. I used the fan brush again to paint the fields and grasses - it is my new favourite brush for landscapes - just works really well and I love the effect it creates. Really pleased with the final painting. Many thanks to Derek Lilly for the reference photo. I have painted a few of these birds before and just love their colouring and spots. Really pleased with how this one turned out. Spotted Pardalotes is one of Australia's smallest birds being only 8 to 10 cm in length. They weigh on average 8 grams. 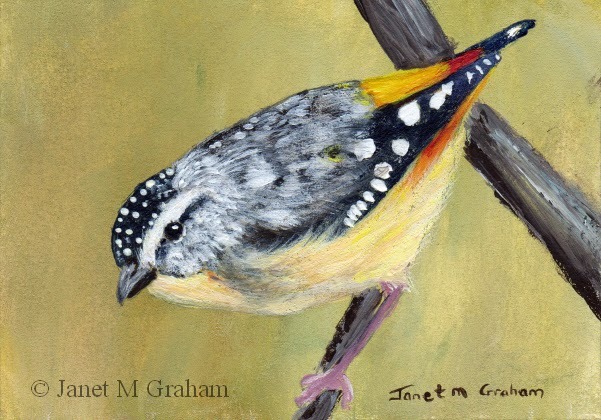 Spotted Pardalote measures 3.5 x 2.5 inches and is painted on 300gsm smooth Arches watercolour paper. 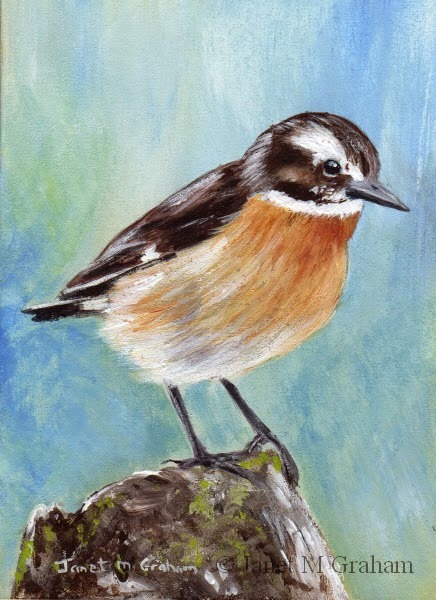 I couldn't resist painting this one - just love the position this little guy is sitting on the branch. These little birds are found across Canada, North eastern and western United states, Mexico and Central America. They are measure around 8 to 11 cm in length and weight on average 5.9 grams. An interest fact about this little bird is that it routinely winters in areas where the night time temperatures goes below -40C. 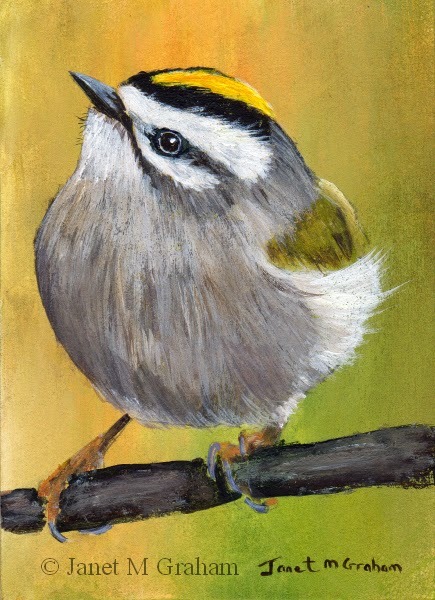 Golden Crowned Kinglet measures 2.5 x 3.5 inches and is painted on 300gsm smooth Arches watercolour paper. Enjoyed painting this one . Really pleased with how the final painting turned out. 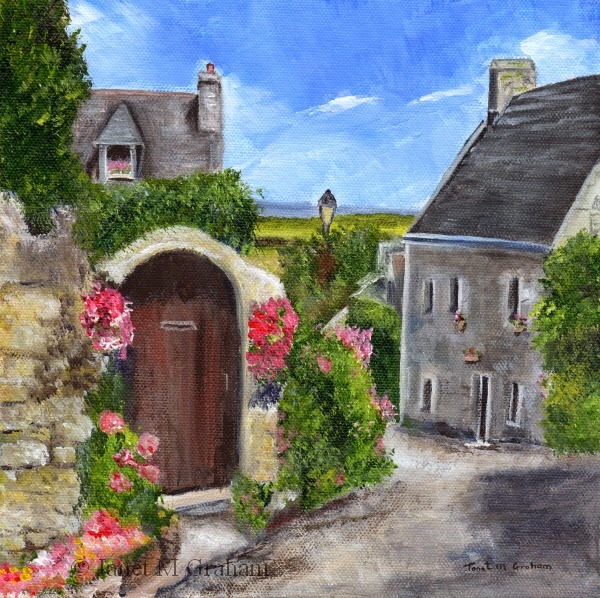 Village Lane measures 8 x 8 inches and is painted on Raymar smooth canvas panel. Many thanks to John Warren for the reference photo. I thought about painting this one in a smaller format but to do the scene justice it needed a larger format. I enjoyed painting this one and I am really pleased with the final painting. 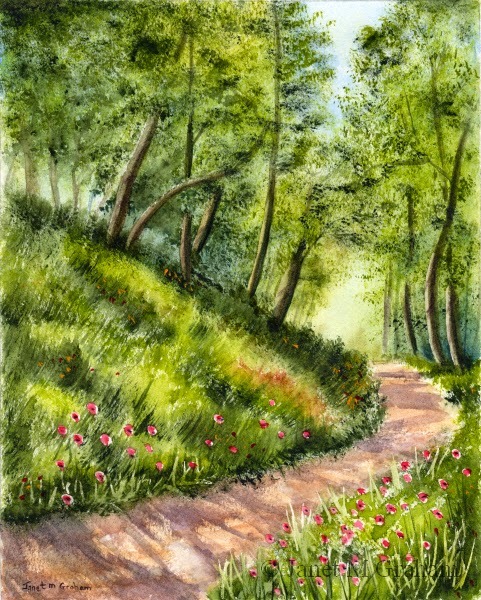 Summers Day measure 8 x 10 inches and is painted on Daler - Rowney 'The Langton' NOT 300gsm watercolour paper. Many thanks to Paul Acarnley for the reference photo. This one was fun to paint. Everything just worked. 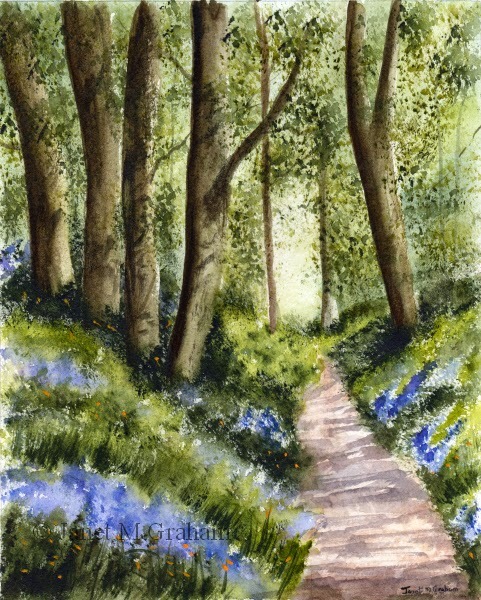 Bluebell Walk measure 8 x 10 inches and is painted on Daler - Rowney 'The Langton' NOT 300gsm watercolour paper. New Holland Honeyeater's can be found throughout southern Australian from Brisbane, to just north of Perth (WA). The are around 18 cm in length and weigh on average 20 grams. 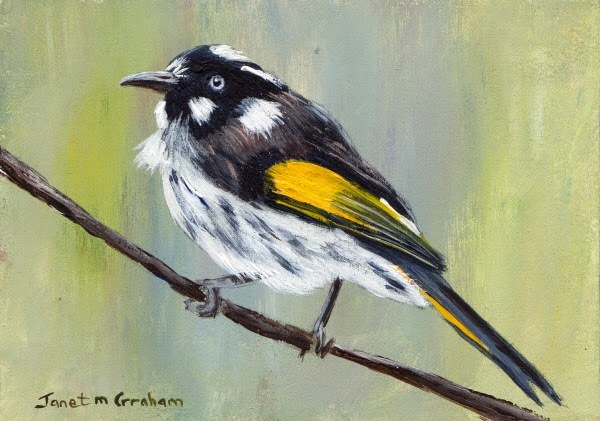 New Holland Honeyeater measures 3.5 x 2.5 inches and is painted on 300gsm smooth Arches watercolour paper. I had to paint this one a little bit differently to how I normally do. Usually I paint the bird on top of the background colour but as I didn't want to paint the bird on such a dark background I decided to paint the background around the bird. It worked rather well. 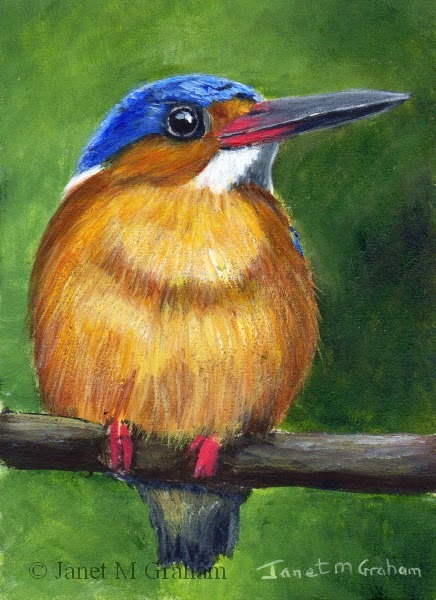 Malagasy Kingfisher measures 2.5 x 3.5 inches and is painted on 300gsm smooth Arches watercolour paper. 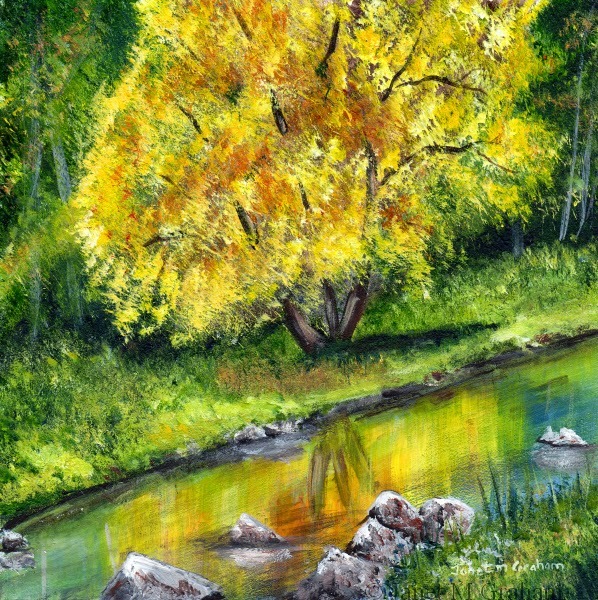 I used the same reference photo that used to paint Fall Stream ACEO a week or so ago but this time round I changed the season to spring and added in the birch trees. Really pleased with how the final painting turned out. 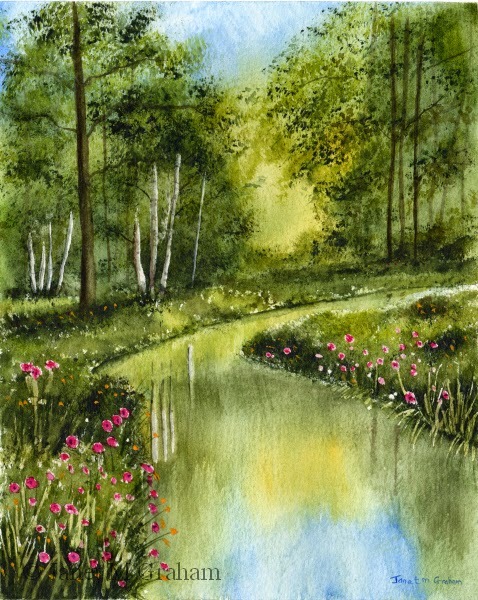 Spring River measure 8 x 10 inches and is painted on Daler - Rowney 'The Langton' NOT 300gsm watercolour paper. Many thanks to Keith Evans for reference photo.